Vocalist Amy Arnell sang with Tommy Tucker’s orchestra during the late 1930s and early 1940s. Arnell, a Virginia native, worked as a secretary and sang in church choirs prior to joining Tucker. Known in the industry by the nickname “Hard Luck Amy,” Arnell’s many mishaps started early and became legendary. Tucker discovered her while she was singing in a San Antonio choir and offered her a job. When she arrived in Miami to join the band, she discovered that she’d miscalculated the time, and the band had left for Detroit a few hours earlier. She grabbed the first train out to follow them. The trip to Detroit was uncomfortable, and she performed her first show with severe back pain. The pain increased so much that on the second day they moved her dressing room so that she wouldn’t have to use the stairs. She ended up in the hospital, operated on for a spinal injury, which put her out of the band for three months. In a similar incident, an hour after a May 1942 show, she had to be rushed to the hospital for an emergency appendectomy. During a 1941 recording session, Arnell sang with a sore throat. Neither she nor Tucker were happy with the results of the session, but Tucker decided to okay the B record anyway. That song, “I Don’t Want to Set the World on Fire,” became their most successful recording, selling over 500,000 copies and moving the band from being a $500 a night orchestra into the top earning bracket. Arnell received a raise and used the extra money to open a flower shop in Hollywood. Arnell left Tucker to go solo in late 1943, hitting the theater and nightclub circuit. At the start of a show in Boston’s Statler Hotel, Arnell found that her microphone was dead. She knew that several producers and scouts were in the audience, so she improvised the best she could, contorting her hands and making silly motions to emphasize her singing. The performance garnered her a role in the touring company of the musical comedy Early to Bed. On opening night in New Haven, Connecticut, Arnell was so nervous that she completely forgot to appear in one scene. 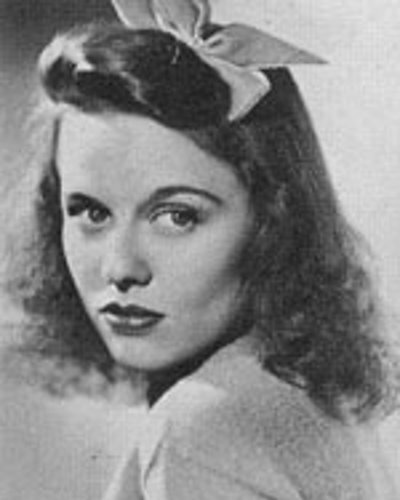 Arnell’s appearance in the play caused Hollywood to take an interest in her, but on the day of her screen test she ended up with a swollen face. She stayed on the West Coast, however, and in January 1946 became a regular on Abbott and Costello’s weekly radio program, replacing Connie Haines, who left to pursue work in nightclubs and on the stage. More mishaps followed Arnell into radio. Her debut broadcast was preempted by a speech from President Truman. The following week, when she was introduced to sing her first number, she discovered that her microphone was dead. In addition to being a featured vocalist with Tucker, Arnell often sang as part of the band’s vocal group, variously known as The Voices Three, The Voices Four or The Voices Five. She appeared with Tucker’s band as a regular performer on George Jessel’s radio program in 1938 and later on NBC’s Pot O’ Gold. “Amy Arnell.” OTRRpedia. Accessed 25 Mar. 2018. “Orchestra at Park Has Six Solists.” The Pittsburgh Press 23 May 1936, 6. “'Breaks' Count in Dance Bands.” The Spokesman-Review [Spokane, WA] 27 Apr. 1942: 9. Tucker, George. “Man About Manhattan.” Prescott Evening Courier [Prescott, AZ] 22 May 1942: 4. “Vaudeville Reviews.” Billboard 30 Oct. 1943: 20. Cohen, Harold V. “Drama Desk.” Pittsburgh Post-Gazette 15 Dec. 1943: n. pag. Cohen, Harold V. “Drama Desk.” Pittsburgh Post-Gazette 12 Jan. 1944: n. pag. Dee, Jay. “West Coast Radio Log.” The Milwaukee Journal 23 Dec. 1945: 9. Profile. “Radio Guide.” Altoona Tribune [Altoona, PA] 19 Mar. 1946: 11.